Collecting easy points with a good square halt at x or rather ensuring that you don’t lose easy points is a priority. Your entry and halt at x is your chance to make a good impression; to get the judge sitting up and taking note that someone who can ride has just entered the arena. At the lower levels it is ok to ride a progressive transition from trot to halt, the judge would prefer a few steps of walk than your horse screeching to a stop. Here’s what to do … think of the halt as just that – a halt; a suspension of the movement; a temporary stop; your horse should be on the aids and waiting for his next instruction! If you have finished the test, you will give the rein and the horse will know it is the end. If you are starting a test, you will give the instruction to continue but the horse should be primed and ready for that next instruction. He has not stopped, he has halted … temporarily. It follows then that the halt should be ‘stepped into’ rather than allowing him to trail out behind and amble to a stop. 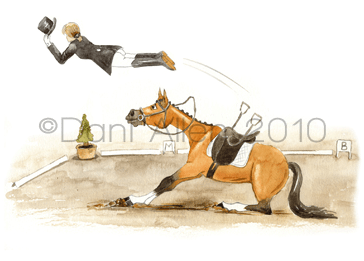 You need to teach your horse to halt from your seat and into a steady contact. Just as an aside … I have seen some pretty extravagant salutes. For the salute, all you do is drop your arm, try gently touching the saddle cloth to make sure your fingers are not flapping (or gesturing!) and that your arm isn’t too wide. No need to raise your arm to your head and for goodness sake do not salute with your whip in your saluting hand! The judge will be very offended.